A Buddhist monk who blessed Everest climbers headed for the summit of the world's highest mountain has died in Nepal aged 87, local officials said Wednesday. Lama Geshe was a fixture of the Everest climbing community and few would dare attempt to climb the fabled 8,848 metre (29,029 foot) peak without seeking his blessing. The Buddhist teacher died on Tuesday morning at his home in the village of Pangboche, which lies in the shadow of Everest in Nepal's Khumbu Valley, former local official Pemba Tshering Sherpa told AFP. 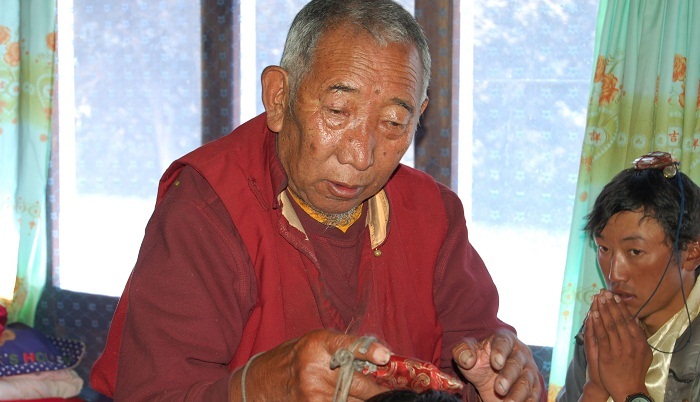 Lama Geshe was revered by the Sherpa community -- a Buddhist ethnic group from the Himalayas who are the backbone of Nepal's mountaineering industry, guiding hundreds of climbers up its mountains each year. Sherpa, who consider Everest sacred and call it Chomolungma ("Goddess Mother of Mountains"), would not climb the mountain without first visiting Lama Geshe. His home became an essential stop for all climbers heading to the mountain. "Sherpas believe that his prayers were extremely powerful in protecting them on Everest," said Dawa Steven Sherpa of Asian Trekking, a mountaineering expedition organiser in Nepal. "There will be a little bit of anxiety among the Sherpa going to the mountain this year because they will be missing a vital ingredient for safety." Each climbing season Lama Geshe would bless hundreds of mountaineers, reciting a mantra, or prayer, to the powerful Buddhist goddess Miyolangsangma who lives at the top of Mount Everest and whom all climbers must appease if they want to safely summit the peak. Tenzing Norgay, the first man to summit Everest with Sir Edmund Hillary in 1953, often said that Miyolangsangma guided him up the mountain and allowed him to reach its peak. Lama Geshe would also give climbers a talisman containing part of the mantra to wear around their necks during their ascent of Everest. Lama Geshe studied in Tibet as a young boy and earned the highest academic achievement among monks, a Buddhist doctorate. He fled Tibet during the Chinese occupation in the 1950s and returned to his childhood home in the Khumbu Valley. He was married and had two children, which is permitted in certain Buddhist monastic traditions.